"This banana bread has no oil, or butter of any sort. It doesn't need it! Because this bread isn't greasy it makes great muffins without the greasy bottoms I have experienced through other recipes. The walnuts are optional." Preheat oven to 350 degrees F (175 degrees C). Lightly grease or line 10 muffin cups. In a medium bowl, combine eggs and bananas. In a separate bowl, mix together flour, salt, sugar and baking soda. Stir banana mixture into flour mixture. Fold in walnuts if desired. Pour batter into prepared muffin cups. 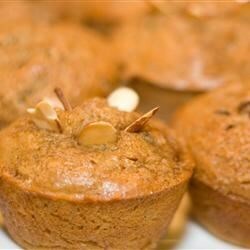 Bake in preheated oven for 20 to 25 minutes, or until a toothpick inserted into center of a muffin comes out clean. I added an extra banana and 1/4 cup skim milk. I also substituted Splenda for the sugar. They came out very tasty and were nice and moist. I was so impressed that there is no oil or margarine in these! They are really good. I substituted 1/2 C oats and 1/2 C whole wheat flour for one of the cups of flour.